During translation, cells make proteins using the genetic information carried in mRNA. A new study shows that an experimental drug can disrupt translation of the PD-L1 protein. Researchers have found an unconventional way to unleash the immune system against liver cancer in mice. Rather than directly blocking the activity of an immune checkpoint protein that shields tumors from the immune system, the researchers used an investigational drug to curb production of the protein. In the NCI-funded study, treatment with eFT508 (a drug also known as tomivosertib) slowed the growth of liver tumors in mice and extended the mice’s survival. Tomivosertib is currently being tested in clinical trials as a potential treatment for several different cancer types, and a trial for people with liver cancer is being considered, said the study’s lead investigator, Davide Ruggero, Ph.D., of the University of California, San Francisco. Although there are several treatment options for liver cancer, it can be difficult to treat, especially when the cancer spreads to other organs. That, coupled with recent sharp increases in liver cancer incidence rates, has put new treatment strategies in high demand. The study, published January 14 in Nature Medicine, reveals a previously unknown mechanism by which cancer cells inflate their levels of PD-L1, an immune checkpoint protein that, when present at relatively high levels, allows cancer cells to avoid detection and destruction by the immune system. Targeting this novel mechanism is “a very attractive approach” because it does not affect normal cells, said Vitaly Polunovsky, Ph.D., of the University of Minnesota, who was not involved in the study. About 20 years ago, Dr. Ruggero began his scientific career by studying how proteins are produced in a microorganism that grows in volcanic hot springs. This work eventually led him to study the same process of protein production in cancer cells. 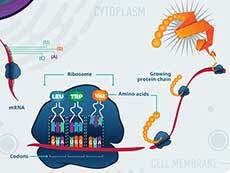 Proteins are produced through two highly coordinated steps. First, a segment of DNA—a gene—is copied into a complementary molecule called messenger RNA (mRNA) through a process known as transcription. In the second step, called translation, mRNA is used as a template to build a protein. In the early 2000s, researchers began to understand that cancer-causing genes (called oncogenes) influence the process of translation, leading to enhanced production of proteins that help tumors grow and survive. Subsequent studies have shown that different oncogenes affect various aspects of the translation process. For example, Dr. Ruggero and his colleagues discovered that some oncogenes increase the activity of a protein called eIF4E, which is needed to start the process of translation. Other studies showed that oncogenes can boost eIF4E activity in two ways: by generating more of it and by chemically modifying it. For example, the MYC oncogene leads to higher levels of eIF4E protein, while the KRAS oncogene promotes modification of eIF4E. When eIF4E’s activity is enhanced, it stimulates translation of a select set of mRNAs, many of which encode proteins that control cell growth, cell survival, and metabolism. As a result, eIF4E hyperactivity is directly linked to cancer initiation and growth. To better understand how translation is altered in cancer, the researchers created two mouse models of liver cancer. One model had liver-specific expression of the MYC and KRAS oncogenes, which are often found in human liver cancer. The other model expressed only the KRAS oncogene in the liver. Although both sets of mice developed liver tumors, in the MYC–KRAS mice, the tumors developed earlier and grew faster. In addition, the MYC–KRAS tumors spread to other organs, while tumors that expressed only KRAS did not. The immune system has the capacity to detect and eliminate tumors, but cancer cells often find ways to hide or thwart an attack. The researchers found that MYC–KRAS tumors contained more cancer-killing immune cells than KRAS tumors. But because the MYC–KRAS tumors also grew and spread more aggressively, the scientists reasoned that the cancer cells might be shielding themselves from the immune system. Next, the investigators examined transcription and translation in tumors from both mouse models. In general, transcription was similar between the mice, both in terms of which genes were transcribed and how much mRNA was made from each gene. However, the level of translation of some genes was different. For example, compared with KRAS tumors, MYC–KRAS tumors translated more mRNA from genes involved in cell division. When they drilled down further, the investigators were surprised to find that the gene for the immune checkpoint protein, PD-L1, was among those that were more actively translated in MYC–KRAS tumors. As a result, those tumors had five times more PD-L1 protein than KRAS tumors. Dr. Ruggero and his colleagues found that the higher level of PD-L1 translation enabled MYC–KRAS tumors to evade the immune system and spread. For instance, when they genetically modified the PD-L1 gene in a way that enhanced its translation in KRAS-mutant cells and implanted the cells into mice, the resulting tumors spread to other organs. Mice injected with MYC- and KRAS-mutant cells also developed tumors that spread. And when they treated mice bearing MYC–KRAS tumors with tomivosertib—which blocks translation by preventing the chemical modification, and activation, of eIF4E—levels of PD-L1 dropped and the abundance and activity of cancer-killing immune cells in the tumors increased. The treatment also slowed tumor growth, prevented the tumors from spreading, and increased survival of the mice. In contrast, tomivosertib did not affect the survival of mice with KRAS tumors. This study demonstrates a novel link between eIF4E, PD-L1, and anticancer immune surveillance, noted Dr. Polunovsky. Is It Safe to Inhibit Translation? Translation is a critical process for all living cells, so is it safe to block it? Studies have shown that stopping production of all proteins is lethal for cells and therefore inevitably leads to toxic side effects. So, although eIF4E shouldn’t be completely inhibited, explained Dr. Polunovsky, an approach that reasonably lowers its activity is predicted to be safe. While cancer cells are addicted to eIF4E-mediated synthesis of specific proteins, healthy cells don’t rely on the overproduction of those proteins. That’s why lowering eIF4E activity specifically kills cancer cells but does not affect healthy cells, Dr. Ruggero explained. In a previous study, he and his team found that reducing eIF4E activity by 50% did not affect normal development in mice but did impair cancer initiation. Another study showed that genetically removing the enzymes that modify eIF4E in mice did not affect their development. In the current study, the researchers did not observe any side effects in the mice treated with tomivosertib, Dr. Ruggero noted. PD-L1 is found at higher than normal levels in some aggressive liver tumors, but immune checkpoint inhibitors that block its activity are only effective for some people with liver cancer. One ongoing clinical trial is evaluating the combination of tomivosertib and immune checkpoint inhibitors in people with nonblood cancers. In addition, a phase 2 trial of tomivosertib in combination with a checkpoint inhibitor for women with metastatic breast cancer is being planned by the pharmaceutical company that developed tomivosertib. And, Dr. Ruggero said, other translation inhibitors developed by the company—which he cofounded—may be moving to clinical trials soon. Like tomivosertib, these drugs target translation factors that are hijacked by oncogenes, he explained. Further down the road, Dr. Ruggero added, there may be a way to block translation of one specific mRNA. “We are working on developing [those] inhibitors. It’s a bit more challenging,” he said.